The Pallet House is a shelter that was designed by i-Beam Design in response to the global refugee crisis. A 250 square foot 'Pallet House' requires 100 recycled pallets nailed and lifted into place by 4-5 people using hand tools in under a week. Wooden shipping pallets provide an inexpensive, readily available, sustainable and highly versatile building module that empowers each family to build according to their own needs. Tarps or corrugated roofing prevent water penetration until enough locally available materials like earth, wood and thatch can be gathered to cover the exterior and fill the wall cavities for insulation. The Pallet House adapts to most climates on Earth and provides a longer lasting, more durable solution to housing some of the world's 33 million displaced people who spend an average of 7 years in refugee camps. 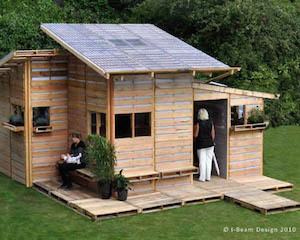 The inspiration for the Pallet House Project came from the fact that 84% of the world's refugees could be housed with a year's supply of recycled American pallets. With one and a half year of pallet production in the US alone, 33 million refugees can live in a Pallet House. Construction plans for the Pallet House are available for purchase for $75 USD.